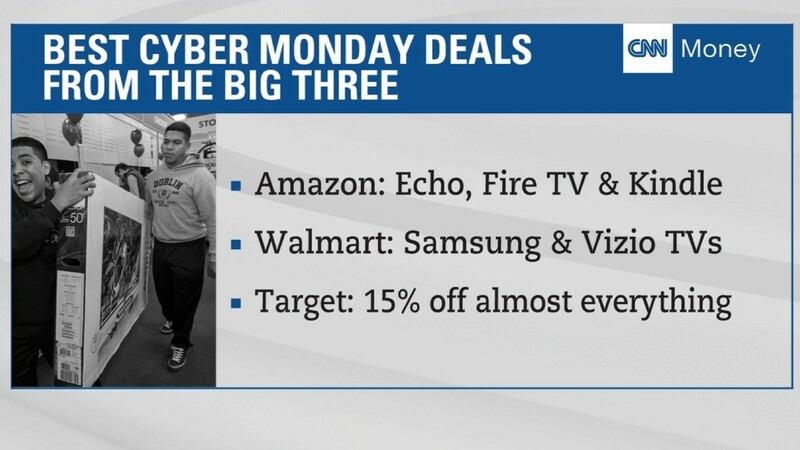 Cyber Monday is here, and shoppers are hopping online to take advantage of some hefty discounts. Consumers have spent $3.39 billion online as of Monday evening, according to Adobe, which is a 10.2% increase year-over-year. Adobe said the most popular electronic purchases include the Sony PS4, Microsoft Xbox, Samsung 4K TVs, Apple iPads and Amazon Fire. Toys are also hot-ticket items, and shoppers bought Lego sets, Shopkins, Nerf and Barbie products. Amazon is offering more than 75,000 sales starting Monday and throughout the rest of the week on a variety of products, including toys, electronics and books. The company is also discounting its own products on Monday: The voice-controlled Echo speaker and the Tap Bluetooth speaker are both being offered at $40 off, for $139.99 and $89.99, respectively. Walmart launched Cyber Week online on Black Friday. On Monday, it slashed prices on a variety of TVs, including a Samsung 65-inch 4K Ultra HD LED Smart TV for $999 and a 50-inch VIZIO 4K Ultra HD SmartCast Smart LED TV for $379.99. Walmart is also discounting toys, including a Barbie Dreamhouse for $149 and a Nerf N-Strike Mega Mastodon Blaster for $51. It's also promoting an Xbox One S Console bundle for $249 that includes a $40 Walmart gift card and your choice of 4K ultraHD movie. Target is also getting in on the deals by offering 15% off most online and in-store purchases -- no promo code necessary. The store is offering up to 25% off toys from K'NEX, Mega Bloks, Magformers and some LEGO sets. TVs are also on sale, with the Samsung 43-inch Ultra HD TV discounted $200 for $399.99, plus a $50 Target gift card. For customers looking to get a little help keeping their home tidy this year, the iRobot Roomba 880 robotic vacuum is priced at $449.99. All online Target (TGT) orders ship free this holiday season. Kohl's rolled out its Cyber Days sale that started Sunday and runs through November 30, and offers discounts on electronics, clothing, home goods and toys. It's also offering an extra 20% off eligible online and in-store purchases with the code DEALSEEKER over the four days. It's offering deals on select Nike products, sleepwear and bedding sets. Melissa & Doug toys are 20% off and some Citizen, Bulova, Invicta and Seiko watches are half off. Best Buy is offering shoppers $200 off on select MacBook laptops and $100 off iPad Pro 12.9-inch models. The retailer is offering free shipping on all orders until December 24. Clothing and accessories tend to be big sellers on Cyber Monday, and many apparel companies are offering significant savings. The Gap (GPS) family, which includes Banana Republic and Old Navy, is offering 50% off sitewide. Express and Hollister are also offering half off. "Fifty percent is the discount to beat right now," said Benjamin Glaser, features editor with DealNews. More than 122 million Americans plan to shop on Monday, with around 23% planning to use their mobile phones, according to the National Retail Federation. Online shopping surged on Black Friday, particularly mobile orders. Shoppers spent $3.3 billion on Friday, according to Adobe, which tracks data about online purchases across the 100 biggest retailers. Mobile shopping hit a record $1.2 billion on Friday.